there's No overfishing these soon-to-be "fries with eyes." It was still dark at 6 am, but the street light shining into the custom aluminum bed of the pickup parked on the Englund Marine dock revealed a mass of finger-length, silvery night smelt. You may not think of smelt as dinner fare — they certainly weren't on my shopping list until someone suggested I was overlooking a local treasure. They were right! Fried smelt are scrumptious, nutritious finger food — crispy on the outside, tender and moist with a mild, sweet flavor on the inside. Smelt are also sustainable, affordable and an integral piece of the local food system. Just three hours ago these little gems were tumbling in the surf to spawn at Gold Beach, as millions do from January through August. Fishermen wait on shore, holding A frame nets not unlike those used by Native Americans, looking for silver in the waves. This had been a successful night of fishing for JJ and Adam Logan, who now had the job of washing 1,300 pounds of smelt. JJ started scooping fish into a large tub of water at the back of the truck with a flat-bladed shovel. A small amount of gravel from the catch sank to the bottom, and the men transferred the clean fish into a bin by hand. The spotlight on the back of the truck illuminated tiny translucent globes floating and clinging to the sides in the wash basin — eggs. Smelt spawn on gravelly, turbulent beaches. The eggs adhere to the gravel, are quickly washed out to sea and hatch in about two weeks. The fact that essentially all the local smelt fishing is done from shore using only hand-held nets precludes overfishing, a major component of sustainable fishing. At its peak, this fishery brought in up to 2.5 million pounds of fish annually, less than 2 percent of the total run. By 2006, with just 17 permits for beach vehicle access issued by Redwood State and National Park, the fishery had diminished significantly. Annual catch now averages about 250,000 pounds. Most of that is sold in stores and restaurants in the Bay area and along the I-5 corridor. About 30 percent is used as feed by aquariums and wildlife care organizations. The surf fishing method also has a very low rate of by-catch, another consideration in the sustainability of a fishery. When the fish are running, the schools are so tightly packed that few other fish wind up in the nets. So why isn't smelt more popular? Perhaps people don't know how to prepare them. 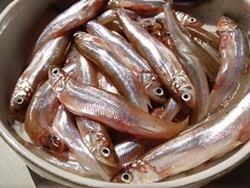 In larger markets, smelt are often sold cleaned, with the heads removed, but locally they appear as whole fish. Very small (3- to 6-inch) whole fish. Night smelt are eaten tip to tail, while day smelt need to be deboned, so be sure you know which kind you're buying. The recipe here is for night smelt, which are available earlier in the year through summer. And with night smelt, size matters: Smaller is better. The favorite way to eat smelt is fried, often whole. The head does add crunch, and some calcium. A popular Bay area restaurant sells them as "fries with eyes." The only drawback to eating them whole is that you may encounter sand. I am not a fan of grit in my fish, so I cleaned the larger ones. With a pair of kitchen shears, cut off the head and cut the bottom of the belly open. You can rinse out the insides with running water or save water by running your thumbnail along the opening, cleaning everything out in one quick motion. In a wide pan, heat ½ inch of oil to 350 F. A little masa dropped in will bubble. In a shallow bowl, mix the masa, salt and pepper. Coat the smelt on both sides with the masa, then carefully slide them one at a time into the hot oil to fry. Allow enough room so they don't touch while cooking. Fry each side of the smelt for about 2 minutes. Drain on a wire rack. These little fish cool quickly, so place them in a warm oven while you cook successive batches. Meanwhile, heat the butter in a sauté pan over medium-high heat. Add the fresh garlic, and when it becomes fragrant, season with salt and pepper and the juice of one of the lemon halves. Just before serving, stir in the fresh herbs, and bring the mixture to a simmer. Pour this over the plated fried smelt and serve immediately with lemon wedges.